I was reading through my twitter feed, today, and came across a really great article by Ellie Slee entitled The Joy of Cooking Without Pictures. The tagline that made me click the article was “Here I am writing about how Instagram ruined cooking for me and weird old cookbooks with no pictures helped me get my kitchen groove back.” I immediately got what she was talking about. I see food pictures that are so flippin’ perfect that no human could have possibly made them – or, at least not in my house. I get perfect picture-taking. I get the art of photography. What I don’t get is the picture taking precedence over the product. Back in my hotel opening days, we’d always have photographers coming in taking pictures for brochures and ads and the like. They were always perfect people in perfectly-fitting clothes and perfect smiles sitting at perfectly-set tables with perfect drinks and plates in front of them. Okay. The hotel is selling illusion, it’s selling style, in some cases, it’s even selling dreams. I get that. But what always set me off was when it came to photographing plates and tray set-ups for the cooks and Room Service staff. These were supposed to be tools for the staff – to make sure the trays went up properly with the right items, condiments, and the like. I would set the trays up and then the photographer would come over and completely rearrange things, add stuff, take away stuff – all to take a lovely staged picture. It could really be a battle constantly asking them to take the picture I had set up – and to stop trying to make it the cover photo of Gourmet Magazine. As Ms Slee explains in her article, cook book photos and other food photos can really be intimidating for a home cook. They’re setting up a level of perfection that often can’t be achieved, causing unmet expectations and feelings of inadequacy. It can flat-out want to make a person stop cooking. Or, as in the case of Ms Slee, it can change how you cook and change your expectations. Cooking without pictures. Opening up a copy of Joy of Cooking – and just following the recipe can be totally liberating. There is no preconceived notion of what a recipe has to look like. You get to make it and allow it to come out however it does. I get wanting to take good pictures. I do it numerous times a week – and sometimes the pictures are stellar and other times, not so stellar. I think the difference with us, though, is the pictures aren’t staged. It’s a snapshot – usually on the kitchen island – of what we’re having for dinner. Sometimes I’m a bit sloppy in the dishing-up, sometimes there’s a bit of smudge on the rim of the plate. It’s Wednesday dinner at our house, not a Michelin 5 Star property. 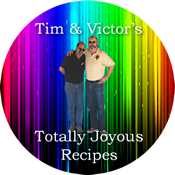 The whole idea of this blog is to share food ideas. Yes, there are pictures, and often even recipes. More often than not, though, it’s a picture with a description of what I did – not a step-by-step with measured ingredients and chiseled-in-stone time frames. I don’t cook that way. I read recipes and then figure out what I’m going to do with it – which is rarely following it to the letter. I think cooking is supposed to be fun, impromptu. I don’t think it’s supposed to be a chore, and I really don’t think it’s supposed to be an ordeal trying to make something look or taste like what someone else did. It should be about you. And right now, it’s about me and what I did for dinner, tonight. I picked up a bag of pasta at Trader Joe’s over the holidays and it’s been sitting in the cupboard ever since. Tonight, it became dinner. I had a chicken breast and a single fresh chorizo sausage to start. I diced the chicken and crumbled the sausage. into the skillet they went. When they were mostly cooked, i took them out and into the skillet went a diced fennel bulb, a small diced onion, and a minced clove of garlic. Into the pan went some smoked paprika, a bit of cumin, and some S&P. I added the meat back in and then added about a cup of red wine. Then, because I thought it needed something else, some olive tapenade that was in the ‘fridge and a bit of cayenne to jack up the heat – the chorizo wasn’t quite as spicy as I had hoped. I brought it all to a simmer and let it cook while I boiled the pasta. The drained pasta went into the pan along with a bit of grated cheese, and dinner was served – with a picture to prove it! Read the article – link above – and then get into the kitchen and cook something.